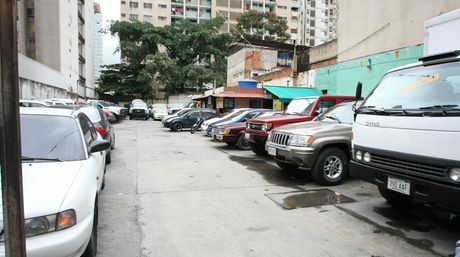 Almost a year ago, I wrote a post about the ordeal that drivers in Caracas and other Venezuelan cities face every day just to find an available parking spot. Well, at least 40,000 parking spaces in Caracas have been lost between 2005 and 2012, according to Benigno Luis Marco, head of the National Association of Parking Lots and Garages (ANPAGE). A 2010 report of the same organization indicated the overall deficit of parking spaces in the capital was around 740,000. There were 800 parking lots at the time, but the report said the city needed at least another 800 more to satisfy the demand. There are multiple reasons behind this problem. During this time, all parking lot-related prices were frozen by the government (until they were finally reviewed last year). But the lack of clear rules and no investment in new spaces (with the exception of private shopping malls) have forced some to even use public sidewalks as an alternative. The lack of parking space is also a collateral damage of the G.M.V.V. housing program, as the State expropiated parking lots to construct new buildings. The irony is that many of those buildings don’t have any garages for their residents, so… they have to leave their cars right out in the open. Think about that the next time you’re stuck in traffic in Caracas.